Tagged under Takeshi Obata, J.C. Staff, Series. As pure shounen action series go, there are certainly stronger options out there, but none of them can match Bakuman. 's writings and few can equal it on the development of its central couple. This is not to say, however, that everything is executed perfectly. The series does have its humorous moments, too, and its ending, which is somewhat cut off many important parts of the original source. Curiously though, that isn't the purpose of the anime is to make a more interpretational ending than the manga. Trust Bakuman. to take what should have been done and turn it on its into a more satisfying end. One may have to muddle through some weak early episodes, but the late pay-off will certainly be worth it. It's the end of the road for Bakuman., they say nice guys finish last. Not so in here. Bakuman is one of the most interesting animes that i watched and it's really funny too..
1-i prefer watching animes on reading mangas. 2-to not spoil the anime later. and one of the things i like most about this anime that it shows the difficult of being mangaka and it's not just a silly thing as how lots think or it's the easiest thing to do in your spare time. for the characters, i surely liked most of them and still liking, i mean they are cute, funny, cool but most important, weirdos! so they must be liked! the art of the anime just has it, telling the truth; i sorta hated it before watching the anime (when i only saw poster), but after a while you'd really like it. it's just very unique and refreshing. THIS without mentioning the fact of it being written by "Obata Takeshi (Art), Ohba Tsugumi (Story)" the same Authors of the phenomenon "Death Note"! The ending! The Ending! I hope to see until they are trully marriedge! argh.................even so, I learn a lot from Bakuman anime and really hope i can't think straight as them when facing difficulty and don't give up their dream no matter what happen...seeing this anime make me more stronger and passionate on my drawing! FIGHTING! Okay I'm going to speak through the manga first of all cause the anime just started running and I've only seen the first two episodes so far. The anime is following faithfully, and the animation is okay kinda loose but okay; now for the manga, it's doing a bang up job it has interesting plot and it delves into the world of a Mangaka and what it takes to make it, it informs the readers about how tough it really is to be mainstream successful as well as all the inner workings of the publishing company,they all are "Gamblers" if your not a "Pro" or successful. Basically, it's a gamble of make it or break it. As far as romance is concerned it's a cutesy blushy...blushy type of love with marriage involved! The message is clear, a dream will remain but a dream unless you act on it and make it a reality, so I suggest check-out the Anime or Manga at least. The story of two teenagers attempting to fulfill their dreams of becoming manga creators is very satisfying because it is not the usual kind of story you would see from Shonen Jump. You know you have a great series when you can take a ordinary story like this and turn it into something so compelling and intriguing. Very well developed characters and amazing art! I was bored and by chance I have listened about the new series from the same creators of Death Note, anime who I liked a lot, and I decided give a chance to Bakuman. On the begin, I think - "What the hell? Love by phone messages? This is really strange.". But the story is exciting and probably will hold your attention. I have watched the complete anime in two weeks, and the manga serie in less than five days. I recommend with you like a good drama. 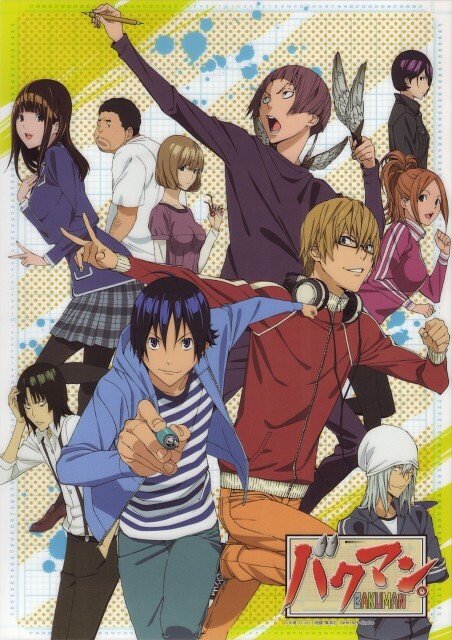 Bakuman is practically one of my favorite anime, it comes after Angel Beats! and DURARARA!!. Anyway, I just practically love how the manga adaptation went really well for this one unlike for Death Note which came from the same authors. The story went on from slow-paced to fast-paced as episodes came by. I think that it started out slow because it basically gives the viewers background as to how things happen in the creation of manga && what it is to know about manga. The characters are really great though at there were some points that I don't like Azuki && i never really liked Kaya, other characters are very much likable(: The conclusion of the first season practically satisfied me. I love how it was very wel wrapped up && how well it will make you look out for the second season. I love it even more as it is more than what we find these days like fighting or something. I always wanted to know how to become a mangaka as that's my dream. Anyway, love the characters and Ohba and Obata are the best duo!! I have seen 4 or five episodes so far, and enjoyed it. However, Bakuman did not manage to catch my attention at that moment, and Mashiro was somewhat getting on my nerves (but Takagi didn't), so I stopped watching. I may be picking it again later, though, because it was kind of funny and light-hearted. Off the bat, first episode already pulls you into the Anime. It also has an interesting concept circling itself. Curious? Watch it, you'll get what I mean. You know what feeling where something feels longer than it really is, 'cause its boring? Well, in my opinion, each episode I watched felt longer than 21 minutes, HOWEVER, it was definitely NOT boring. There were no filler episodes with completely redundant contents/information. I personally thought that was one of its strong points, and it also informs you of a lot you don't know about Manga production. Recommended! Yeah! this one is really INSPIRING me! Good work from Obata Takeshi & Ooba Tsugumi!! Dreams, Fights, and Love!! SUBARASHII!! The idea is so simple. A daily life of mangaka. Bakuman has two point, first it can spread a knowledge 'bout mangaka as benefit job in Japan, then the second is more like an autobiography of Takeshi Obata & Ooba Tsugumi :D since both of them are alike Mashiro Moritaka & Takagi Akito.